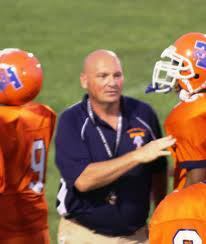 “The camp/system was a key factor in our team’s success in 2011 at Timmonsville High School. As a coaching staff we knew that the offense we ran in 2010 did not fit our current personnel and we consequently determined that the Flexbone offense was a good fit. With installing any new offense, two critical factors will determine its effectiveness: 1) For the coaching staff it’s the knowledge and understanding of the offense to implement it. 2) For players it’s the ability to buy into the offense and execute it without hesitation. The Flexbone system reduced the learning curve for those two critical factors for us by about 2 years and allowed us to experience immediate success. The Camp/System gave us everything we needed at the end of camp for me to do long range planning for the entire season with daily practice schedules. My assistant coaches had the knowledge and resources to coach position specific drills. My offensive coordinator had the information to put together a game plan and call plays in a strategic fashion. During the season if questions arose we would go back to the DVDs, visit the website or Lou Cella was just a phone call or email away for one on one advice. My players became a team during camp and finished camp with confidence and enthusiasm for the Flexbone offense that gave them the zeal to look forward to Summer practice and a chance to put the new offense into action through competition. The team building: enthusiasm and confidence and skills that were built in my players by the camp carried over into the season and was evident in our success. We were able to defeat our rival twice in the same year, which had not been accomplished since 1999. We had an opportunity to play for a region championship. We were able to defeat a team that has knocked us out of the State playoffs and Timmonsville High progressed to the South Carolina state semi-finals in our classification losing out by just 2 points. We increased our rushing yardage by 20% and rushing touchdowns by 50%. We plan to build on the success of this year for next season. The value of the camp cannot be measured in dollars and cents, although if you approach it from that angle it was a very cost effective strategy for us. I know many coaches would rather install an offense the traditional way by researching it, visiting colleges that run the offense and then picking coaches for information. The offense is then modified for their use using trial and error to develop the offense that best suits their high school’s team needs.